Do you know Dena Designs? Even if you don’t know the name, you’ve probably seen her work. It’s so fun and whimsical. Her Happi line was a favorite of mine! Dena is an amazing artist, all of her home decor, stationery and fabric designs are based on her original artwork. Her motto is “surround yourself with the things you love” – that’s how I like to live, too! I’ve had so much fun playing with Dena Designs fabrics lately. I used a variety of fat quarters from her Free Spirit fabric line called Tangier Ikat to create this Easy reversible tablecloth. No pattern, but I’ll try to explain the process. I cut each fabric print to be the same size (approx. 18 x 24). Then, I sewed them together in rows – short sides to each other. For my table, I needed not quite 3 rows wide. So, some rows needed half units on the sides. I got a little fancy and decided when sewing the rows together to stagger where the seams go. So, instead of a traditional lined-up patchwork, it’s random. After I assembled the top, I added a vintage sheet for the back, and I was done. That’s the best part – no batting, no quilting. Sew the top and bottom right sides together, leave a space to turn it, top stitch all the way around and done! So, even a beginner seamstress can make it! All straight line sewing. So easy, I can’t wait to make more tablecloths! And, it’s machine washable – great when you live with boys like I do. 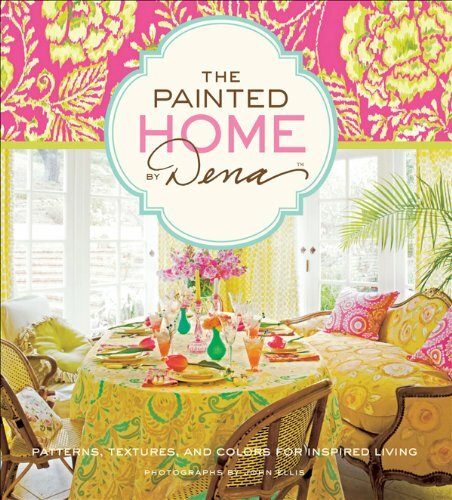 For more inspiration from Dena, check out her book, The Painted Home. It’s a room by room tour of her amazing home with detailed photos and descriptions. There are 20 projects included. Seriously, it’s worth buying just for the eye candy. Every time I open it, I see a new idea. Disclosure: Please note: I was not financially compensated for this post. I received supplies for review purposes. As with all content on my blog, the above project and comments are completely my own, based on my own experience. One Response to "Easy Reversible Tablecloth with Dena Designs Fabrics"
Can you post a close up pic of the stich you made around it to sew the back and top layer together? Did you do it inside out and then leave a little spot to fold it back right side in or just sew the sides just like it is? I love this and think it would be very cute in my rv. Just not sure on which stich to use on my machine and if I sew the layers together with material inside out or not…like you would a pillow case per say.